Over the course of time, your iPod Touch begins to lose its performance because it is occupied so much unnecessary data or files. The more you use a car without performing routine maintenance, the worse its performance becomes. This is also true for iPod Touch or other iDevices generally. 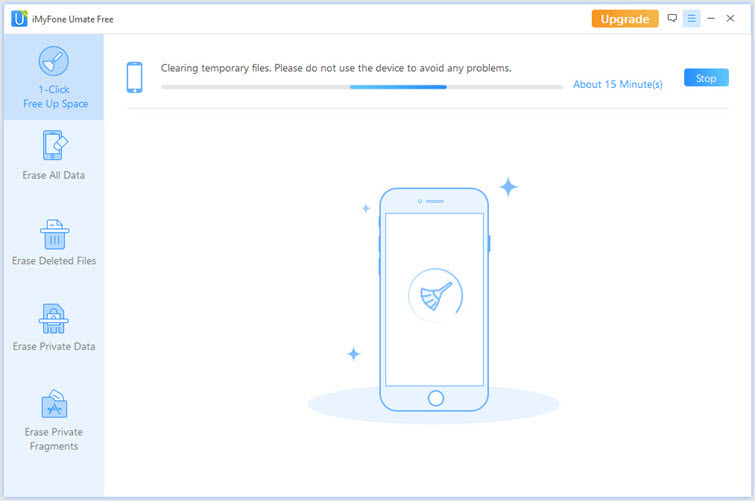 So iPod Touch cleaners is in essence software tools or utilities that help users perform routine cleaning on their iPod Touch. They perform routine checks and analysis of the memory, and perform tasks of space saving. 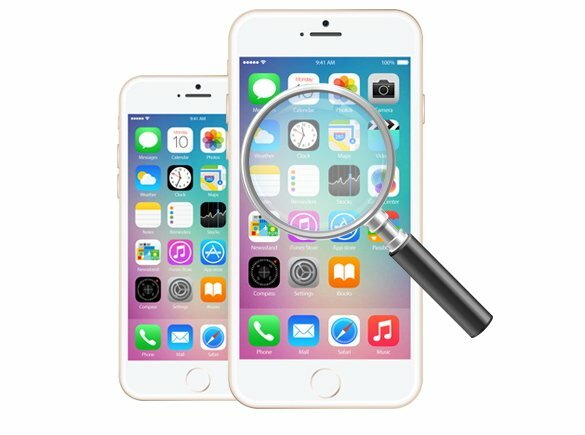 In this article, you will learn how to use free iPod Touch cleaner, iMyFone Umate Free, to perform “routine maintenance” on your iPod Touch. iPod Touch usage over time gathers data, like cookies, logs, temporary files, history, etc. The same way more mileage causes cars to gather dust, gather more dirt in the fuel and oil filter. The following are the ways in which temporary and junk files gather. Data exchanges between applications make use of temporary files. Browsers store pictures, videos and audios in cache files to make browsing faster. Cookies track and store information about web sessions. Interrupted files are stored somewhere in memory. iMyFone offers iMyFone Umate Free its powerful iPod Touch cleaning utility. With this free version, you can perform the cleaning of junk files, and the deletion of temporary files in one click. 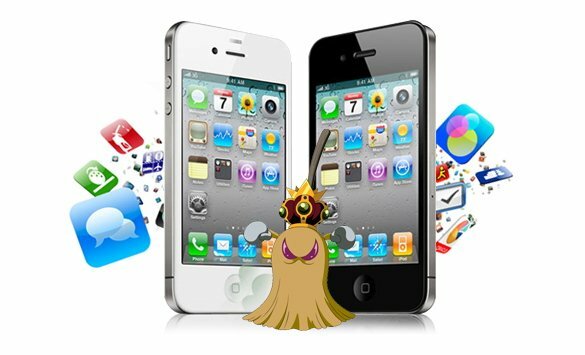 With just these options, you can free up huge storage space of you iPod Touch, so as to improve the performance of your device. Additionally, you can analyze and view the amount of other space you can save with this fully functional iPod Touch cleaner. 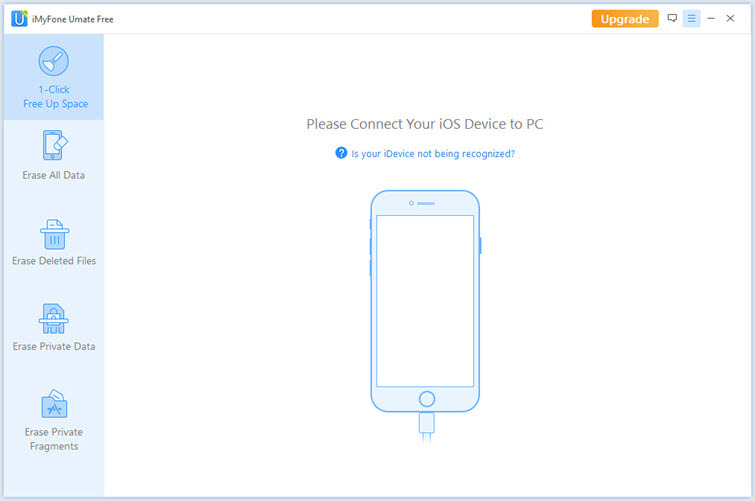 Plug your iPod Touch to your computer system with iMyFone Umate Free running. Kindly note that iTunes is required for iMyFone Umate Free to connect with your device. Make sure that your iTunes can recognize your iPod Touch. If not, please download the latest iTunes. Generally, when iTunes can recognize the iPod Touch, the free iPod Touch cleaner will do. Scan your device with the “Quick Scan” button on the iMyFone user interface. This action shows you the volume of space you’ll be saving by using each feature on this free iPod Touch cleaner. You can clear the junk files and temporary files from the home screen where the “Quick Scan” result is displayed. The “Quick Scan” result gives you the definite size of the junk files on your iPod Touch. Proceed by clicking the “Clean” button of Junk Files. Check all the options to ensure all the junk files on your iPod Touch are cleared. To remove the temporary files, just repeat the above steps for junk files. The only difference is to click the “Clean” button of the Temporary Files line. iMyFone Umate Pro or iMyFone Umate Pro for Mac is the update of above free iPod Touch cleaner. Beyond clearing junk files and deleting temporary files, there are amazing other features iMyFone Umate Pro packs that perform additional powerful cleaning tasks or private protection on your iPod Touch. So what are the features and functions you can look forward to in the paid version? 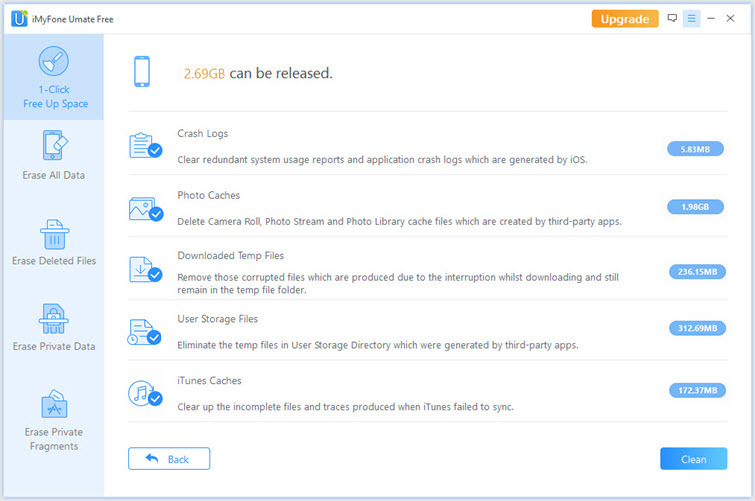 Complete Space-saving Analysis for Your iPod Touch: Analyze how your space is split out on your iPod Touch – junk files, temporary files, photos, large files and apps. Compress Losslessly & Delete Photos: You can reclaim as much as 75% of photo space without damaging invisible quality by compression. Photos will be backed up on computer first before compression or deletion. Backup and Delete Large Files: You can make huge space savings by backing up and deleting large files like videos and audio files. Manage Apps: Manage redundant iPad apps that aren’t relevant anymore, and free up more space to install new and relevant apps. Erase All Data: Permanently Erase all settings and contents on your iPod Touch and make it as a new one. Erase Private Data & Deleted Files: Find out and completely erase the existing data as well as the preciously deleted files.